Instead of leaving your old cell phone in a drawer to collect dust, donate it to Forbes House! Our organization can make money from donations of cell phones, smartphones, iPads, and iPods. 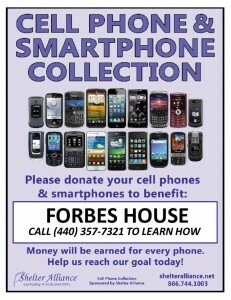 If you have an old cell phone or device that you are no longer using, please consider donating it to Forbes House. The phone does not need to be working or have a battery to help us earn money. Each donated phone earns money for the organization. To date, Forbes House has been able to earn $4,196 due to these donations! If you are interested in donating your device or learning more about the program, please call (440) 357-7321.